Prior to September 11th, 2001 the private sector was well aware of the threat of terrorism. However, the terrorist threats they perceived were different than those perceived today. In the early 1990s, firms were mostly concerned about overseas employee kidnapping (Harvey 1993). Ports were more concerned with theft and smuggling (Thibault et al. 2006). Beyond airline hijackings, the use of supply chain assets as a method to inflict damage was far from the minds of corporate America. 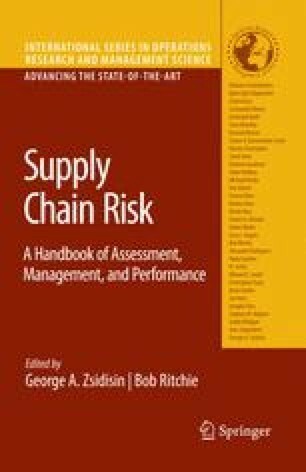 The remainder of this chapter will focus on a particularly important and vulnerable subset of the broader supply chain concept: food supply chains. The first section will explore the importance and challenges associated with food supply chain security. Section 2 will detail best in class security practices used by firms in the food industry. Section 3 discusses the role of security in the supplier selection decision. Finally, the chapter concludes with managerial implications.